Ducati is issuing two recall notices for 2012 and 2013 Panigale motorcycles due to an increased risk of a motorcycle accident. The recall affects 2,411 motorcycles manufactured from March 16, 2012 through July 12, 2012. The first recall is for the right and left swingarm shaft pivots. These pivots can loosen and lead to a loss of control and increase the risk of an accident causing serious injury. More information on this recall can be found on NHTSA’s website under recall number 12v401000. The second recall is for the front brake master cylinder reservoir hose. The reservoir hose can lead to inference with the threading end of the reservoir screw causing damage to the hose and potentially leading to a front brake system failure. A front brake system failure can lead to catastrophic injuries. More information for this recall can also be found on NHTSA’s website under recall number 12V402000. Both recalls are expected to begin September 17. If you believe, your motorcycle may contain the defective parts you may take it into a dealer and receive an inspection and the necessary services to fix the defect free of charge. Owners may also contact Ducati directly at 1-800-231-6696. The injuries sustained because of a motorcycle accident are typically serious, often permanent, and sometimes deadly. Recent stats state that motorcycle accidents are a large part of accident-related fatalities each year, approximately 8%, even though motorcyclists represent only 2% of drivers on the road. Motorcycles provide little protection in a crash and if riders are not wearing protective equipment, the injuries will be severe and sometimes fatal. Defective motorcycle parts can increase the risk of a motorcycle accident. The defective product lawyers at the Strom Law Firm believe companies should be held responsible for injuries and/or deaths suffered because of their defective product. 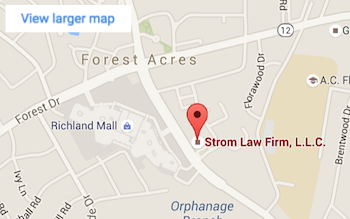 If you or a loved one were injured or died resulting from defective motorcycle parts or other defective products the Strom Law Firm can help you. We understand injuries can be costly which is why we will fight to get you compensation for your injuries. Call us today or fill out a web form for a free consultation. 803.252.4800.